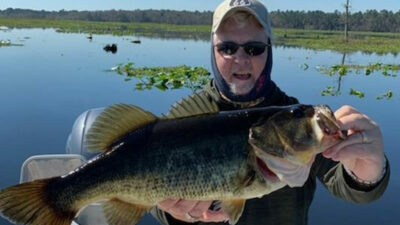 Have you ever wondered where you can catch a trophy largemouth bass in Florida? Several locations across the state can provide you with the ultimate bass fishing experience. One, in particular, is consistently producing excellent fishing all year round. Come explore February Trophy Bass Fishing on the Rodman Reservoir in North Florida. Visit Gainesville, FL for a fishing adventure of a lifetime. 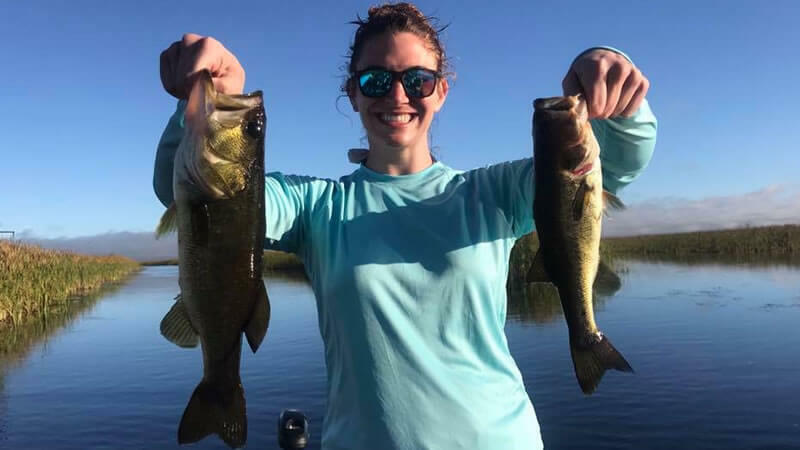 Our local experts have spent years and hours of their time honing in their skill of bass fishing. One of our main goals here is to make sure you have a remarkable experience. We want you to come to explore the Rodman Reservoir and catch the bass of your dreams. Captain’s Ken Walker and David Lang are your local experts on your next fishing adventure. Captain Ken Walker had the pleasure of fishing with Brad Lewis and his 16-year-old son Luke. They were traveling from South Carolina looking to explore what the Rodman Reservoir had to offer. It was Luke’s birthday and his dad wanted to get him on big bass. If there was one place in Florida to do it, the Rodman Reservoir was it. It came through big time for this father-son duo. 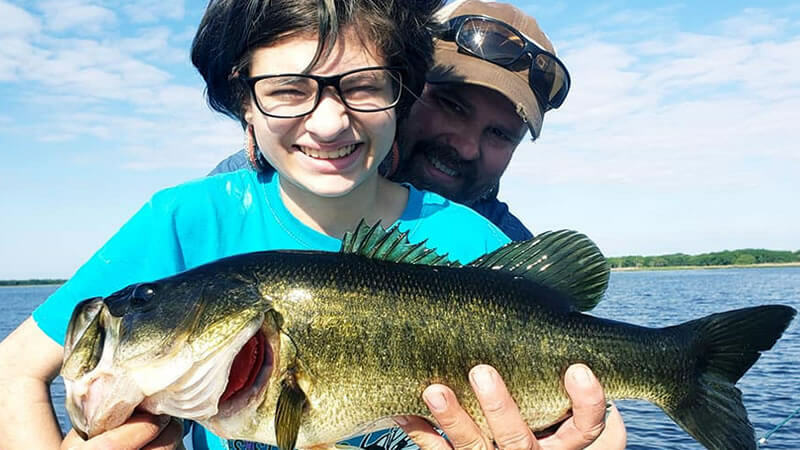 The fishing was slower than normal but Brad’s wish for his son came through. The first big bass Luke caught was 7.1 pounds. This fish was better than his personal best but not the biggest of the trip. Shortly after this monster bass, the trophy bass came out to play. 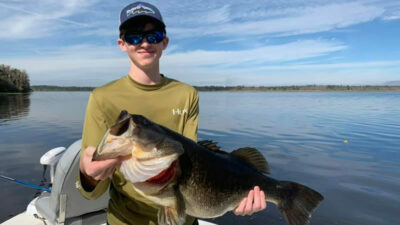 Luke landed a 10 pounds 13 ounce Florida largemouth bass with wild-caught live shiners. The numbers may have been low but the quality of bass was there. You truly can’t beat this place. 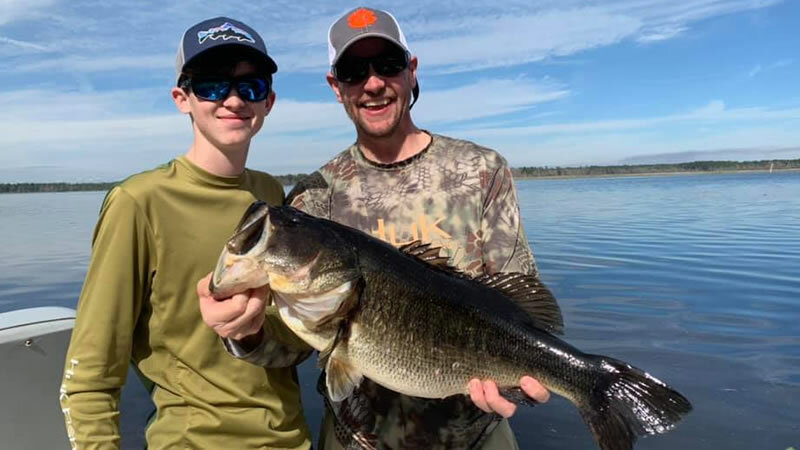 This father-son duo had the time of their life catching these big bass. Brad and Luke will be back for more action in the future. Captain Ken is looking forward to their next adventure. Just shortly after this fishing trip, Captain David Lang adventured out on the Rodman Reservoir. He had the pleasure of fishing with Harry and his son-in-law Damien. They were traveling to beautiful and sunny Florida on vacation. 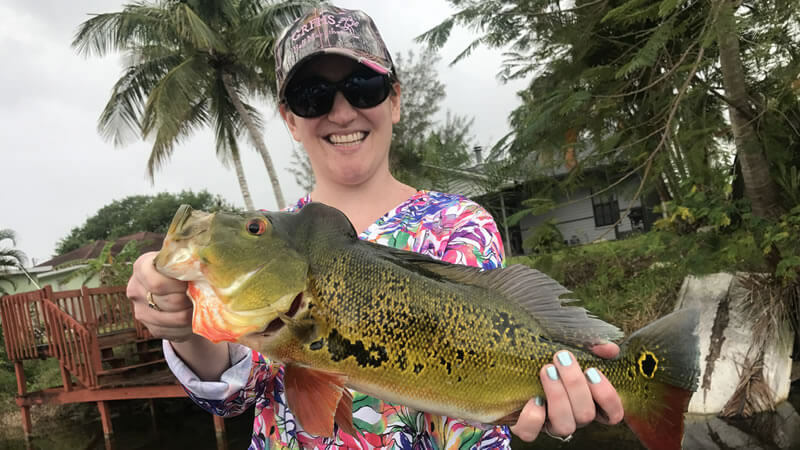 While here, they had to see what Florida bass fishing had to offer. North Florida and the Rodman Reservoir had something in-store for them. 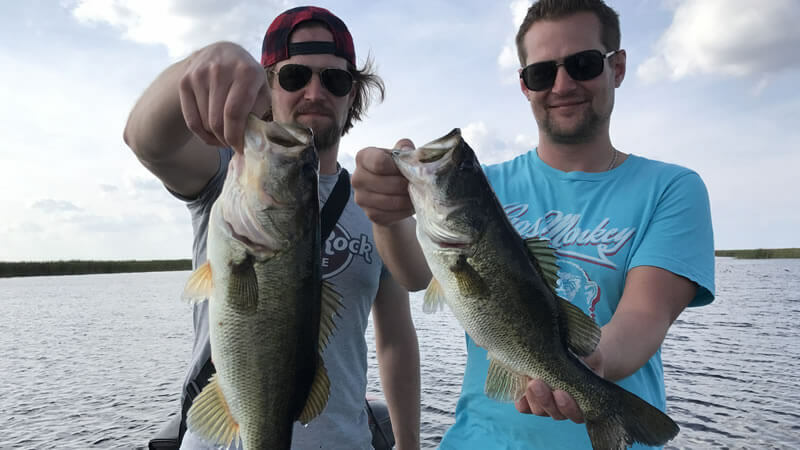 Harry and Damien boated over 15 Florida largemouth bass. They had a lot of great numbers of bass between 4-5 pounds. The biggest bass weighed in at 7.5 pounds. Harry and Damien could not have been happier nor had a better day. The weather was beautiful and the sun was shining. They will be back for more incredible action and Captain David is looking forward to what’s to come. It was not long after this awesome fishing trip that Captain Ken was back out on the water. He had the pleasure of fishing with long-time friend and first-time client Chris and his lovely wife Cheryl. It was yet another fantastic day on the water with some BIG bass in the boat. The Rodman Reservoir is forever giving with exceptional fishing adventures every time you embark on one. 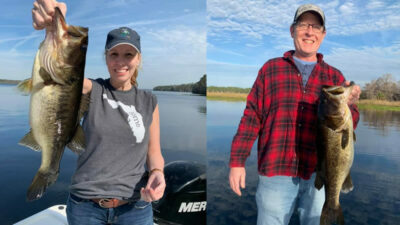 Chris and Cheryl caught over 20 nice Florida largemouth bass. Chris caught a trophy personal best largemouth bass weighing in at 8 pounds 2 ounces. Also, Cheryl caught her personal best bass at 6 pounds. Even Captain Ken got the chance to catch a few bass. Nothing beats getting on the water with your great friends and showing them an awesome time. Captain Ken is looking forward to seeing them on the water next time! If you are wondering where you can have a great time catching big bass, the Rodman Reservoir is your answer. Consistently, all year long, you can catch trophy-sized bass on the Rodman Reservoir. 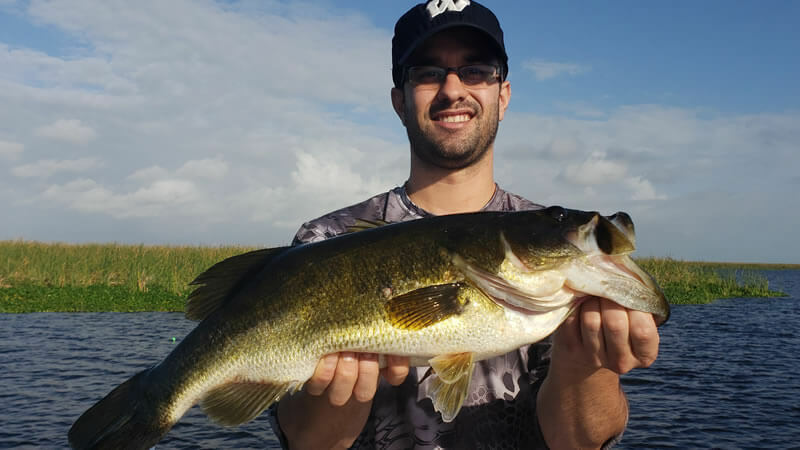 It is one of the most breathtaking fisheries in the state of Florida for catching bass. We would love for you to experience it. We look forward to seeing you on the water next time!